You can add properties to the login form gadget to allow you to control additional aspects of its behavior while editing a page or page template. For example, you might want to hide the Forgot password link or the Remember me checkbox. You might also want to allow an administrator to add some explanatory text to the gadget through its settings. You can use this same approach to add other settings to other gadgets. Enable theme overrides and download the theme files. We'll create a new version of the gadget, preserving the original version, just in case. 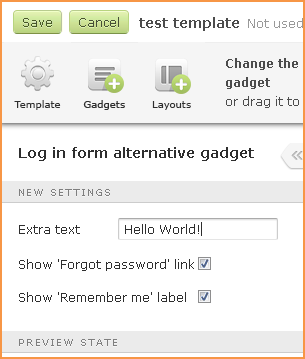 Under the /Gadgets folder within the downloaded theme files, create a Login.LoginFormAlternative folder. Copy all content from the /Gadgets/Login.LoginForm folder to the new /Gadgets/Login.LoginFormAlternative folder. Here we define three new settings: ExtraText, ShowForgotPassword and ShowRememberMe. We also set text labels for the fields, and align them and set their display width. Here, we define that ExtraText is a string, and ShowForgotPassword and ShowRememberMe are boolean. We also set default values for the booleans (showing Forget password and Remember me by default) and set the width of the checkboxes. Note we use the same names as in SettingsLayout.cfg. Next, we need to connect the settings to the gadget's HTML code. 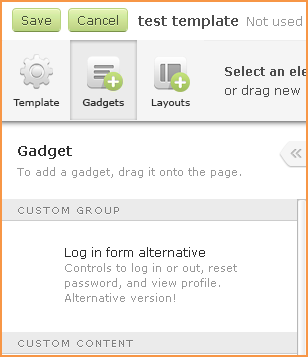 To do so, open GadgetTemplate.tpl within /Gadgets/Login.LoginFormAlternative for editing. This will check if ExtraText is set, and if yes, will render a DIV tag containing the text entered in the gadget settings. Save your changes to GadgetTemplate.tpl. Upload all new and modified files and folders to the appropriate folder under the Theme_Overrides folder on your site via File management or WebDAV. Return to the Theme overrides screen and rebuild the theme. You can now open a page for editing and find the new gadget in the gadgets list under Custom Group. After dragging the gadget to the page, you can modify the new gadget settings.